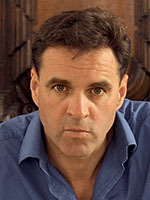 Niall Ferguson is a Senior Fellow at Stanford University’s Hoover Institution, a Senior Fellow of the Center for European Studies at Harvard University, and a Visiting Professor at Tsinghua University in Beijing. 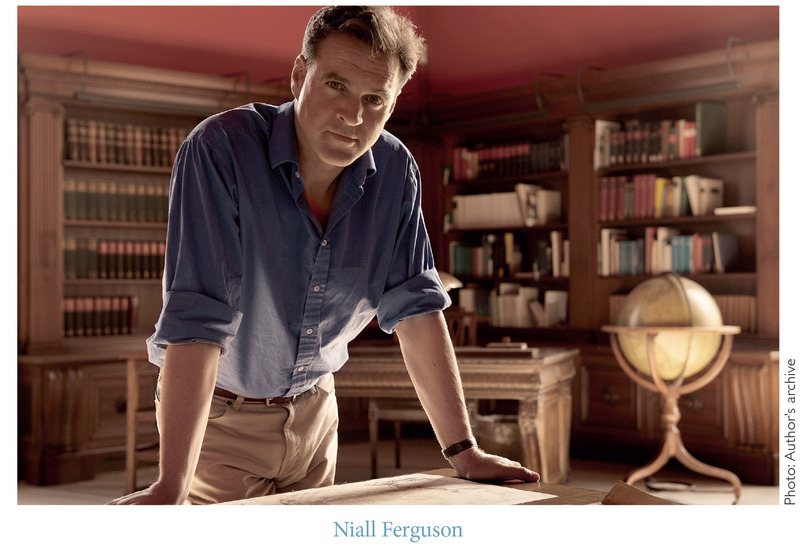 You may follow him on Twitter @nfergus. Anyone who has read Philip Roth’s brilliant counterfactual novel, The Plot Against America (2004), will already have felt a shudder of panic at the prospect of a Republican victory in the coming U.S. elections. In Roth’s story, a candidate campaigning with the slogan “America First” wins the 1940 presidential election, defeating Franklin D. Roosevelt, and proceeds to lead the United States down the path to fascist hell. Such comparisons between the United States today and Germany in the 1930s are becoming commonplace. As a professional historian, I would like to offer what seems to me a better analogy. Journalists are fond of saying that we are living in a time of “unprecedented” instability. In reality, as numerous studies have shown, our time is a period of remarkable stability in terms of conflict. In fact, viewed globally, there has been a small uptick in organized lethal violence since the misnamed Arab Spring. But even allowing for the horrors of the Syrian civil war, the world is an order of magnitude less dangerous than it was in the 1970s and 1980s, and a haven of peace and tranquility compared with the period between 1914 and 1945. This point matters because the defining feature of interwar fascism was its militarism. Fascists wore uniforms. They marched in enormous and well-drilled parades and they planned wars. That is not what we see today. So why do so many commentators feel that we are living through “unprecedented instability?” The answer, aside from plain ignorance of history, is that political populism has become a global phenomenon, and established politicians and political parties are struggling even to understand it, much less resist it. Yet populism is not such a mysterious thing, if one only has some historical knowledge. The important point is not to make the mistake of confusing it with fascism, which it resembles in only a few respects. Rather like a television chef, I shall describe a recipe for populism, based on historical experience. It is a simple recipe, with just five ingredients. The first of these ingredients is a rise in immigration. In the past 45 years, the percentage of the population of the United States that is foreign-born has risen from below 5 percent in 1970 to over 13 percent in 2014—almost as high as the rates achieved between 1860 and 1910, which ranged between 13 percent and an all-time high of 14.7 percent in 1890. So when people say, as they often do, that “the United States is a land based on immigration,” they are indulging in selective recollection. 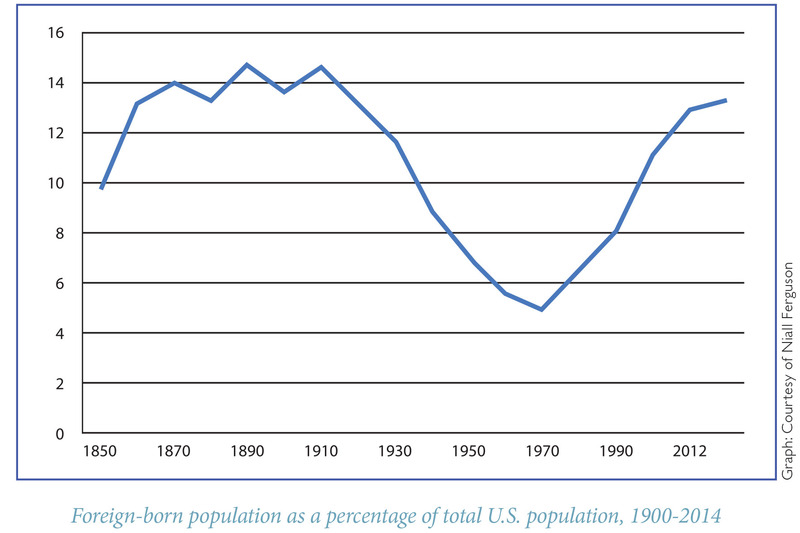 There was a period, between 1910 and 1970, when immigration drastically declined. It is only in relatively recent times that we have seen immigration reach levels comparable with those of a century ago, in what has justly been called the first age of globalization. Ingredient number two is an increase in inequality. Drawing on the work done on income distribution by Thomas Piketty and Emmanuel Saez, we can see that we have recently regained the heights of inequality that were last seen in the pre-World War I period. 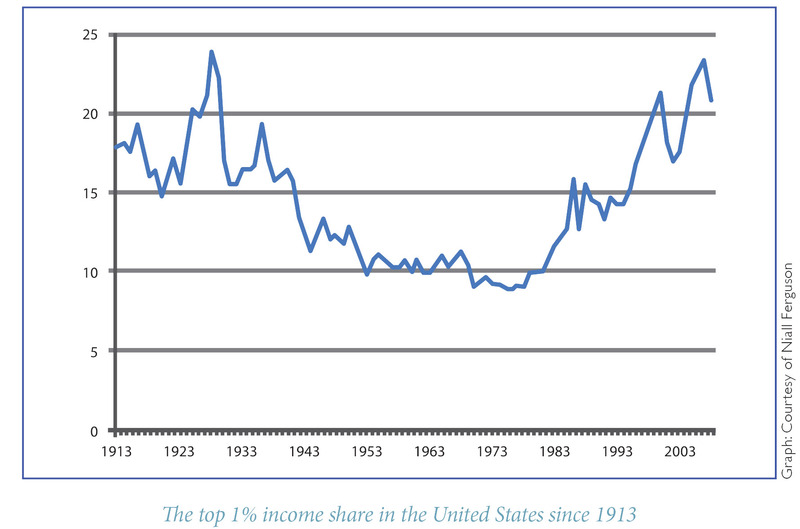 The share of income going to the top one percent of earners is back up from below 8 percent of total income in 1970 to above 20 percent of total income. The peak before the financial crisis, in 2007, was almost exactly the same as the peak on the eve of the Great Depression in 1928. Ingredient number three is the perception of corruption. For populism to thrive, people have to start believing that the political establishment is no longer clean. Recent Gallup data on public approval of institutions in the United States show, among other things, notable drops in the standing of all institutions save the military and small businesses. Just 9 percent of Americans have “a great deal” or “quite a lot” of confidence in the U.S. Congress—a remarkable figure. It is striking to see which other institutions are down near the bottom of the league. Big business is second-lowest, with just 21 percent of the public expressing confidence in it. Newspapers, television news, and the criminal justice system fare only slightly better. What is even more remarkable is the list of institutions that have fallen furthest in recent times: the U.S. Supreme Court now has just a 36 percent approval rating, down from a historical average of 44 percent, while the Presidency has dropped from 43 percent to 36 percent approval. The financial crisis appears to have convinced many Americans—and not without good reason—that there is an unhealthy and likely corrupt relationship between political institutions, big business, and the media. The fourth ingredient necessary for a populist backlash is a major financial crisis. 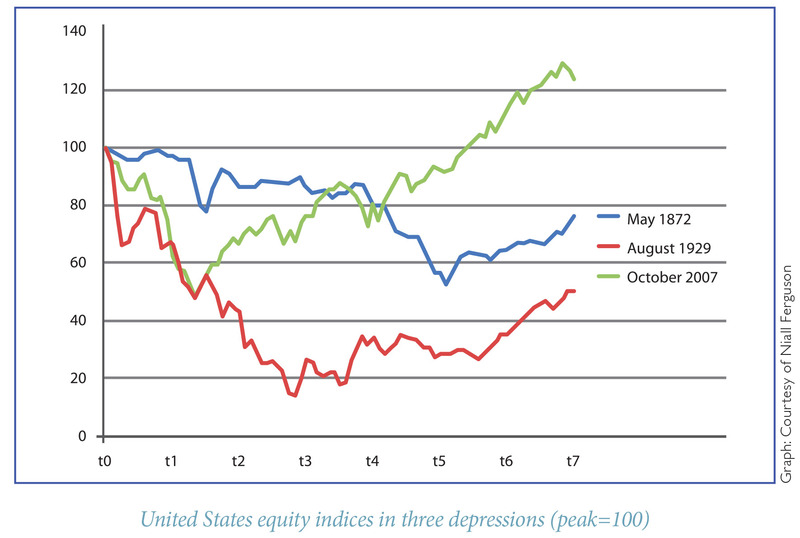 The three biggest financial crises in modern history—if one uses the U.S. equity market index as the measure—were the crises of 1873, 1929, and 2008. Each was followed by a prolonged period of depressed economic performance, though these varied in their depth and duration. In the most recent of these crises, the peak of the U.S. stock market was October 2007. With the onset of the financial crisis, we essentially replayed for about a year the events of 1929 and 1930. However, beginning in mid to late 2009, we bounced out of the crisis, thanks to a combination of monetary, fiscal, and Chinese stimulus, whereas the Great Depression was characterized by a deep and prolonged decline in stock prices, as well as much higher unemployment rates and lower growth. We have come a long way since those days; gold is no longer a key component of the monetary base, and farmers are no longer a major part of the workforce. Nevertheless, in my view, the period after 1873 is much more like our own time, both economically and politically, than the period after 1929. There is still one missing ingredient to be added. If one were cooking, this would be the moment when flames would leap from the pan. The flammable ingredient is, of course, the demagogue, for populist demagogues react vituperatively and explosively against all of the aforementioned four ingredients. Now, my argument is not intended to dismiss or downplay those elements of Donald Trump’s campaign for President of the United States that have been implicitly, if not explicitly, racist. Nor do I treat lightly the various signals he has given of indifference to, or at least ignorance of, the U.S. Constitution. My point is that these demerits do not by themselves qualify Trump for comparison with Mussolini, much less with Hitler. Rather, I want to argue that Trump has much more in common with the demagogues of the earlier, lesser depression of the late nineteenth century, and that it is to that period that we should look for historical analogies and insights. The best illustration of my case is the now forgotten figure of Denis Kearney, leader of the Workingmen’s Party of California and the author of the slogan “The Chinese Must Go!” Himself an Irish immigrant to the United States—as opposed to the son of a Scottish immigrant and grandson of a German, which is what Donald Trump is—Kearney was part of a movement of nativist parties and “Anti-Coolie” clubs that sought to end Chinese immigration into the United States. The realities were, it scarcely needs to be said, very different. According to the “Six Companies” of Chinese in San Francisco—corporate bodies that represented the Chinese population of the city—there was compelling evidence that Chinese immigration was a boon to California. Not only did the Chinese provide labor for the state’s rapidly developing railroads and farms; they also tended to improve the neighborhoods in which they settled. Moreover, there was no evidence of a disproportionate Chinese role in gambling and prostitution. In fact, statistics showed that the Irish were more of a charge on the city’s hospital and almshouse than the Chinese. Neither Democrats nor Republicans had done, nor seemed likely to do, anything to remove these evils or to improve the lot of the people. They were only seeking (so men thought) places or the chance of jobs for themselves, and could always be bought by a powerful corporation. Working men must help themselves; there must be new methods and a new departure […] The old parties, though both denouncing Chinese immigration in every convention they held, and professing to legislate against it, had failed to check it […] Everything, in short, was ripe for a demagogue. Fate was kind to the Californians in sending them a demagogue of a mean type, noisy and confident, but with neither political foresight nor constructive talent. Kearney may have lacked foresight and “constructive talent,” but there is no gainsaying what he and his ilk were able to achieve. Beginning with the Page Law (1875) prohibiting the immigration of Asian women for “lewd or immoral purposes,” American legislators scarcely rested until Chinese immigration to the United States had been stopped altogether. The Chinese Exclusion Act (1882) suspended immigration of Chinese for 10 years, introduced “certificates of registration” for departing laborers (effectively re-entry permits), required Chinese officials to vet travelers from Asia, and, for the first time in American history, created an offense of illegal immigration, with the possibility of deportation as a part of the penalty. The Foran Act (1885) banned all contract laborers from immigrating to America. Legislation passed in the Scott Act (1888) banned all Chinese from travel to the United States except “teachers, students, merchants, or travelers for pleasure.” In all, between 1875 and 1924, more than a dozen pieces of legislation served to restrict and finally end altogether Chinese immigration. No one should therefore underestimate the power of populism. For all his coarseness and bombast, Denis Kearney and his allies effectively sealed the American border along the Pacific coast of the United States; indeed, one cartoon of the time depicted them constructing a wall across the San Francisco harbor. In the 1850s and 1860s, as many as 40 percent of all Chinese emigrants had travelled beyond Asia, though the numbers arriving in the United States had in fact been relatively small (between 1870 and 1880, a total of 138,941 Chinese immigrants came, just 4.3 percent of the total, a share dwarfed by the vast European exodus across the Atlantic in the same period). What exclusion did ensure in the late nineteenth was that Chinese immigration would not grow, as it surely would have, but instead dwindled and then ceased. Populism, then, is not just a form of political entertainment. One sometimes hears it said of Donald Trump: “Ah, he says wild things on the campaign trail, but when he is president it will be fine.” History suggests otherwise. It suggests that men who threaten to restrict immigration—as well as to impose tariffs and to discourage capital export, as populists generally do—mean what they say. Indeed, populists are under a special compulsion to enact what they pledge in the campaign trail, for their followers are fickle to begin with. In the case of Trump, most have already defected from the Republican Party establishment. If he fails to deliver, they can defect from him, too. Of course, populists are bound eventually to disappoint their supporters. For populism is a toxic brew as well as an intoxicating one. Populists nearly always make life miserable for whichever minorities they chose to scapegoat, but they seldom make life much better for the people whose ire they whip up. Whatever the demagogues may promise—and they always promise “jam today”—populism tends to have significantly more economic costs than benefits. Restricting immigration, imposing tariffs on imported goods, penalizing firms for investing abroad: such measures, if adopted by an American government in 2017, would be almost certain to reduce growth and employment, rather than the reverse. That has certainly been the Latin American experience—and few regions of the world have run the populist experiment more often. The foreign dimension brings us to a final irony. Despite their habitual insistence on narrow national self-interest, populists are nearly always part of a global phenomenon. Globalization had been making enormous strides prior to 1873, with world trade, migration, and international capital flows growing at unprecedented rates. But the crisis of that year generated a populist backlash against globalization that was itself global in its scope. Then, just as now, the principal targets of the demagogues were immigration, free trade, and high finance. Just as the United States excluded immigrants and raised tariffs, so did European countries by adopting similar discriminatory measures. In Bismarck’s Germany, populism was often antisemitic—as it was in the France of the Dreyfus Affair—while in late Victorian Britain it was anti-Irish. Tariffs went up almost everywhere except in Britain. Populism today has a similarly global quality. In June, the British vote to leave the European Union was hailed by populists right across the European continent as well as by Donald Trump in the United States and, implicitly, by Vladimir Putin in Russia. Let me conclude with a note of qualified optimism. Because populism is not fascism, populist victories should not be construed as harbingers of war—if anything, the opposite is true. In the 1870s and 1880s, populists did achieve significant reductions in globalization: not only immigration restrictions, but also higher tariffs. But they did not form many national governments, and they did not subvert any constitutions. Nor were populists much interested in starting wars; if anything, they lent towards isolationism and viewed imperialism as just another big business racket. In most countries, the populist high tide was in the 1880s. What came next—in many ways as a reaction to populism, but also as an alternative set of policy solutions to the same public grievances—was Progressivism in the United States and socialism in Europe. Perhaps something similar will also happen in our time. Perhaps that is something to look forward to. Nevertheless, we would do well to remember that World War I broke out during the progressive not the populist era. The world today is, as I observed at the outset, in much less turmoil than one might infer from television news. Nevertheless, the economic and social consequences of globalization and the most recent financial crisis sowed the seeds for the populist backlash that we now see. Populists are not fascists. They prefer trade wars to actual wars; administrative border walls to more defensible fortifications. The maladies they seek to cure are not imaginary: uncontrolled rising immigration, widening inequality, free trade with “unfree” countries, and political cronyism are all things that a substantial section of the electorate have some reason to dislike. The problem with populism is that its remedies are wrong and, in fact, counterproductive. What we most have to fear—as was true of Brexit—is not therefore Armageddon, but something more prosaic: an attempt to reverse certain aspects of globalization, followed by disappointment when the snake oil does not really cure the patient’s ills, followed by the emergence of a new and ostensibly more progressive set of remedies for our current malaise. The “terrible simplifiers” may have their day then. But they will end up yielding power to well-intentioned complicators, those more congenial to educated elites, but probably every a bit as dangerous, if not more so.